San Diego and Coronado have been one of my favorite spots for vacations for quite some time. I adore the beach and I love California, but Coronado has a special atmosphere; it feels more small-town and quiet than the rest of San Diego. You can enjoy a relaxing day by the beach and then you can take a short taxi ride to the Gaslamp Quarter for restaurants, bars and shopping. Coronado and San Diego offer the perfect balance for a vacation. And, of course, I wouldn’t keep going back somewhere unless they had some great places to eat! I really love gelato, and this place takes the cake as the BEST gelato I’ve ever had. The flavors were so perfect and bold that I actually ordered vanilla! We happily went here two days in a row. I just couldn’t believe how much their flavors tasted like the real thing- banana actually tasted like I was eating frozen bananas. 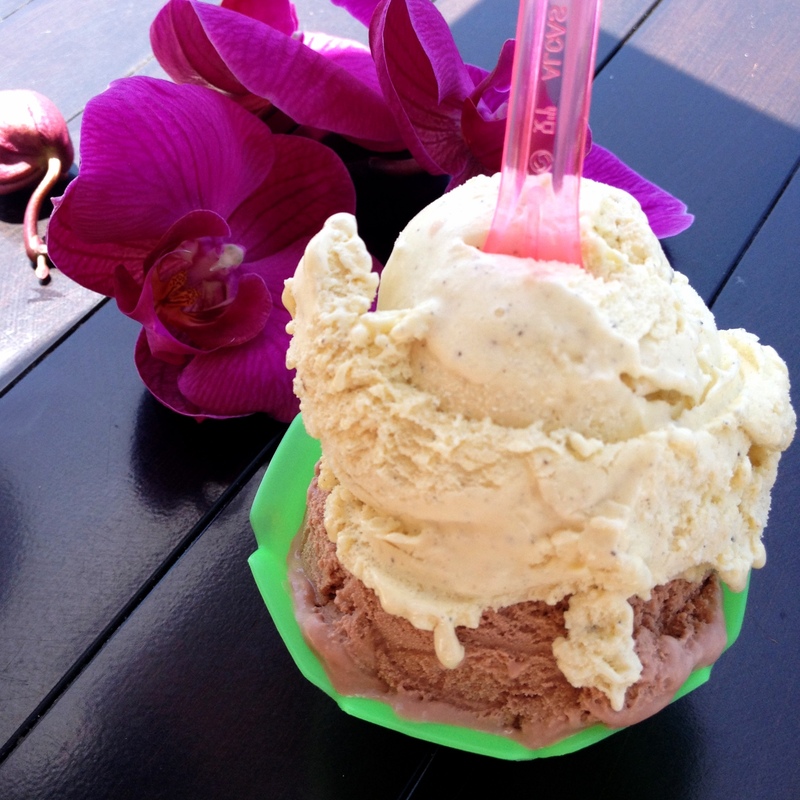 Their gelato is just incredible, Nado is a MUST visit in Coronado. 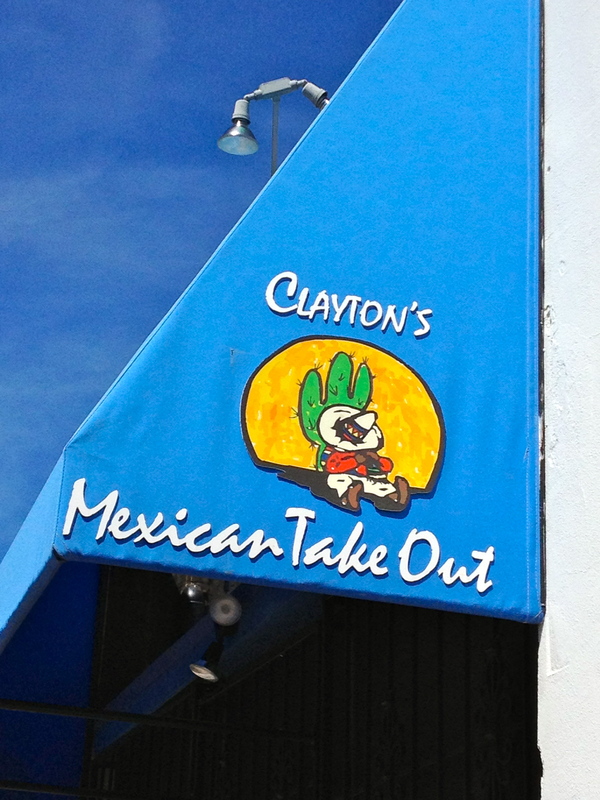 Clayton’s Mexican Take Out has been a favorite for years. We asked a local where to find some yummy street tacos and he gave us directions to Clayton’s; a restaurant barely big enough to fit a kitchen, there is only seating outside. 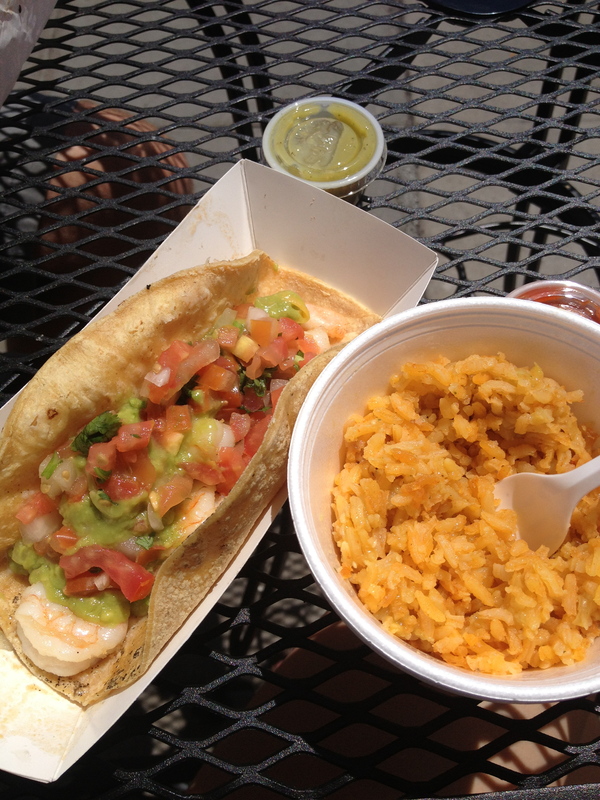 Their carne asada is so flavorful and their shrimp is always perfectly cooked. Try the carne asada fries or shrimp tacos. You can’t leave without some bunuelos! Fried tortilla strips coated in sweet cinnamon sugar are the best way to end your meal here. 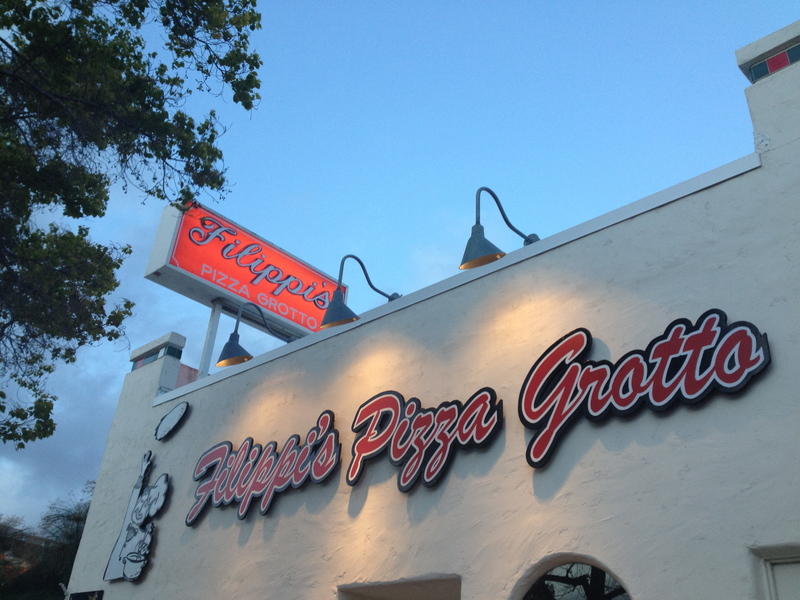 Filippi’s Pizza Grotto in Little Italy stands out in my mind as my favorite restaurant that I’ve ever had the joy of dining at in San Diego. 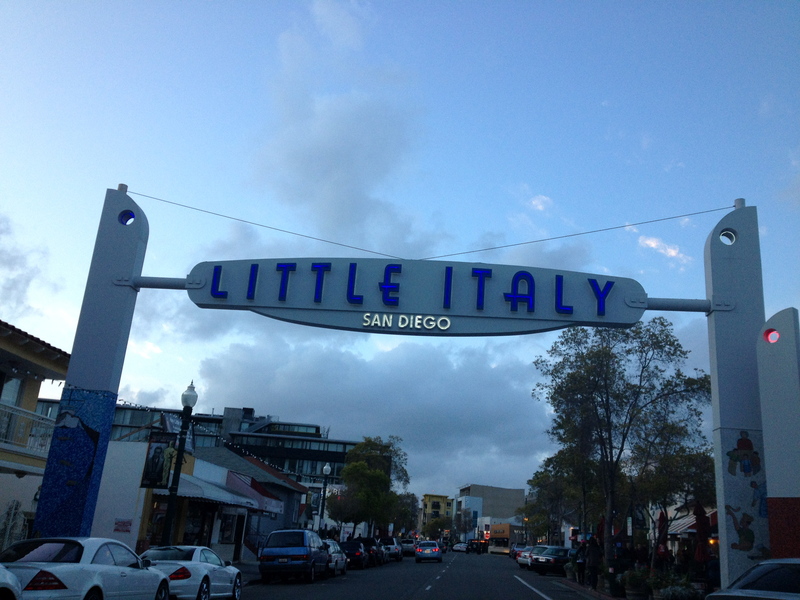 They serve up pasta, pizza, salads and other Italian favorites. Anything you order will be amazing, but my favorite is their good old classic spaghetti and meatball. I say meatball, not meatballs because their meatballs are roughly the size of a baseball! Their marinara sauce is the most perfect marinara sauce I’ve ever had. Also, Filippi’s antipasta salad is a great way to start out your meal alongside the rolls with butter that they happily provide. While you’re at Filippis, order a bottle of Filippi’s chianti. Or two: one for dinner and one to bring home. This wine is my favorite and I always try to bring home a bottle or two with me while I am visiting. If you’re a chocolate fan (how could you not be?) 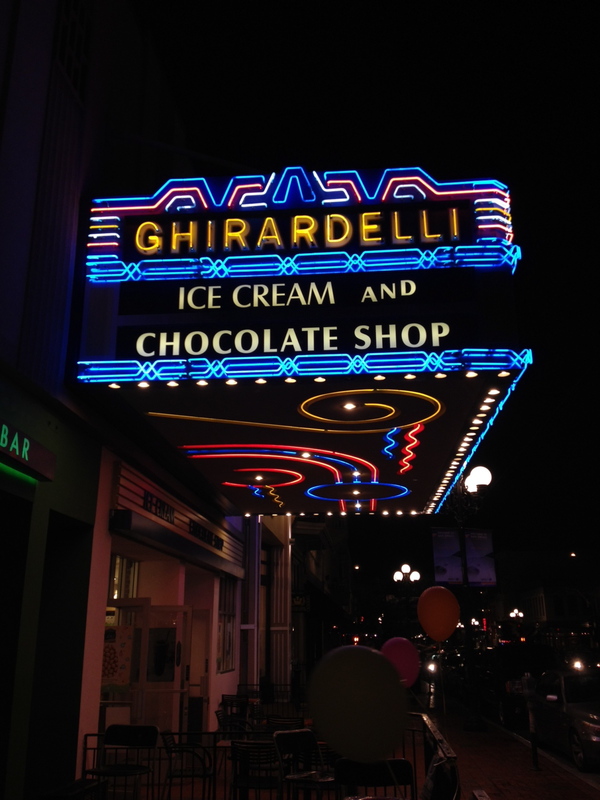 you cannot miss the Ghirardelli Ice Cream and Chocolate Shop. Here you can stock up on your favorite Ghirardelli squares, or you can mix and match ones that you’ve never had before. 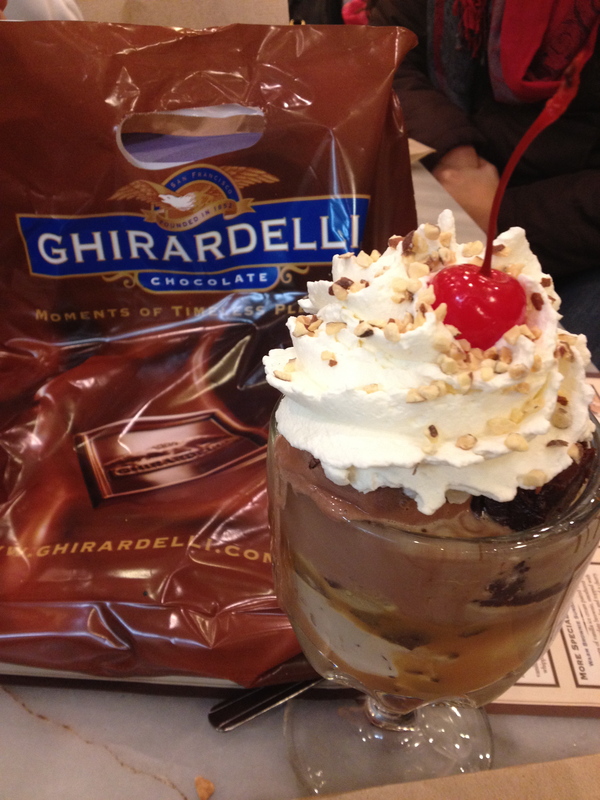 In addition you can experience the wonder and perfection of the Ghirardelli ice cream sundae. If you’re visiting Coronado then there’s a good chance that you’ll end up at the Del at some point or another. While you’re there admiring the hotel’s grandeur, stop by the little cafe in the hotel and order a chocolate croissant (or 5). When we visit Coronado, we wake up at the crack of dawn (okay, 8:00) to head to the cafe and get chocolate croissants. They are worth waking up early on your vacation and they are worth the price, I promise you. If you don’t want to wake up early, don’t worry, sometimes you can get lucky if they have a few leftover later in the day. 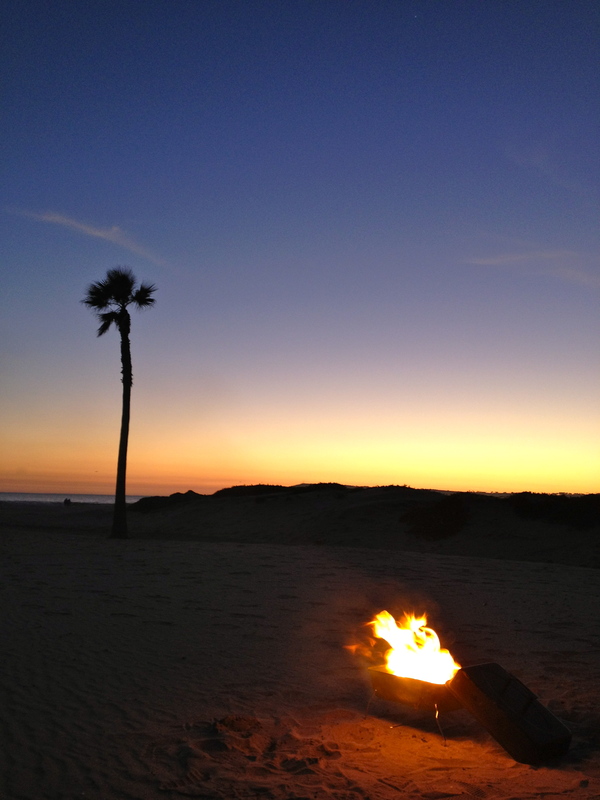 The best way to enjoy a beach sunset is with a beach BBQ. 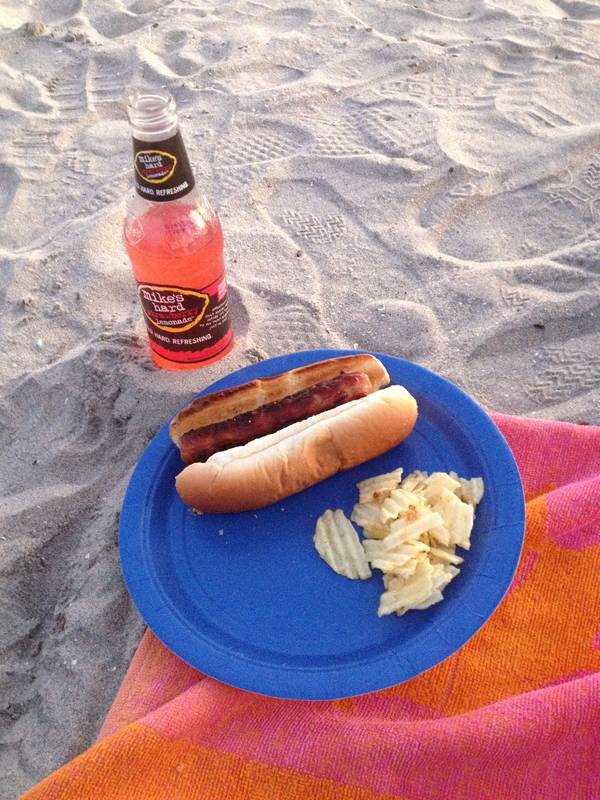 If you don’t have the ability to BBQ your own dinner, grab takeout and have a beach picnic instead. Grab a sweatshirt and spread out an oversized towel and enjoy mother nature’s show. Coronado beach is my favorite in San Diego, probably because we’ve been coming here for so long. Regardless, it is a really beautiful beach. During some seasons of the year you can find an abundance of sand dollars in the tide if you know where to look. In addition, you can explore the tide pools in the rocks. We’ve seen crabs, fish, starfish, hermit crabs, snails and more while exploring the tide pools. My friends and I decided to rent bikes for an hour on my most recent trip to Coronado. We had quite the myriad of bikes; a team of tandem bikes, beach cruisers, as well as other two person seated bikes, we blazed through the town exploring, giggling and enjoying the sights. Bike rentals are not expensive and it’s a fun way to stay active and see more of the area. 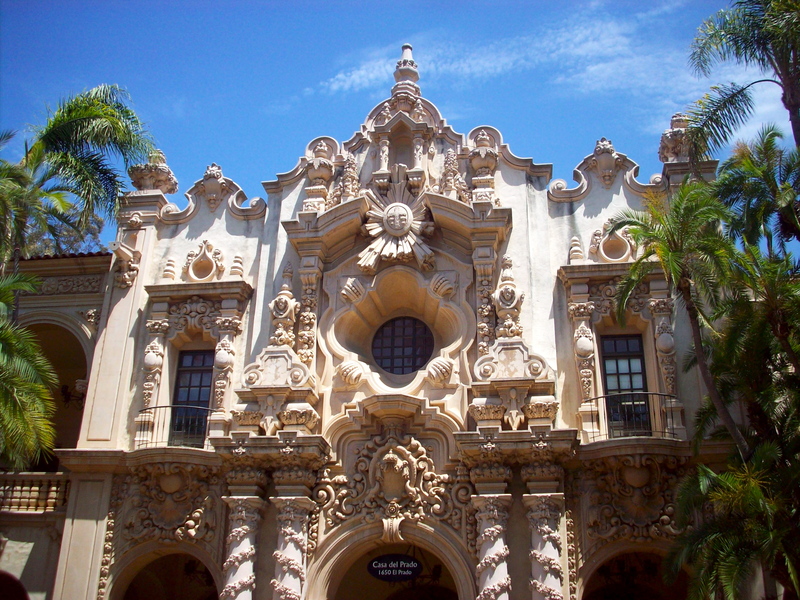 Balboa Park is one of the most beautiful places I’ve been to in California. 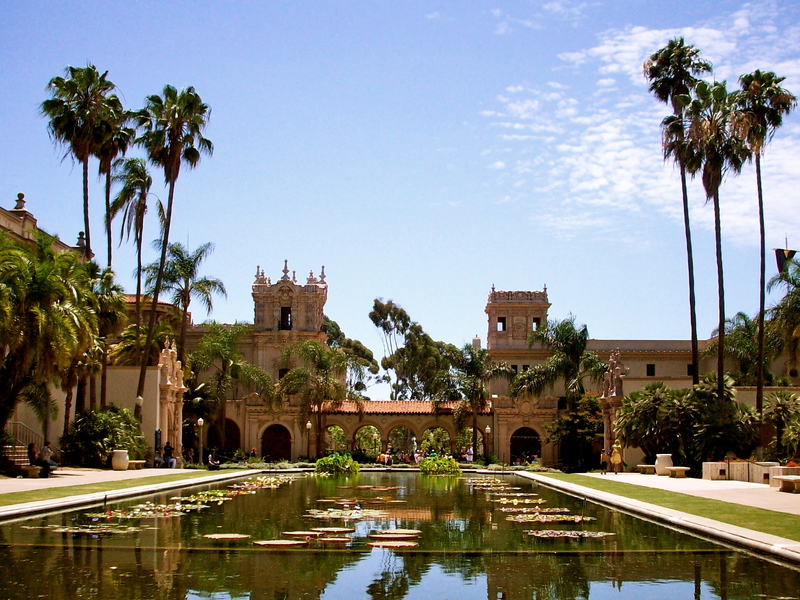 The ornate buildings and the elaborate gardens and lily ponds are captivating. Just walking around here is enough for me, but they also have museums and other attractions in the park. Before I launch into a review about eateries in Vegas, I have to admit something. I’ve only gambled in Las Vegas one time. That’s because every time I have been to Las Vegas it has been to visit my Aunt, Uncle and three cousins who live there. We don’t usually go to the strip, and when we do it’s to see the Bellagio fountains or to eat a delicious crepe from the Paris Paris hotel. As a result, I’ve had the opportunity to explore restaurants in the area from a local’s point of view, plus I’ve eaten most of my meals off the strip, which may be off the beaten path for some tourists. The result? Vegas has some great places to eat. Don’t go to Las Vegas without stopping at Luv Its. Their frozen custard is amazing and they always have rotating flavors so you’ll never get bored if you happen to go every day during your trip! My favorite flavor is their banana nut, especially as a sundae with caramel and peanuts! You can’t miss out on Luv It. While you’re on the strip, make sure you stop in the Paris Las Vegas Creperie to enjoy a fresh crepe. You have to get it a la mode, of course! This one crepe was enough for me, my aunt, and my three hungry cousins to share! They’re divine and they have fillings and toppings to suit anyone’s taste. Settebello pizzeria is one of my favorite gems that I have discovered, although it is not exactly in Las Vegas. It is in Henderson, which is a nearby city that we drive through when we return to Arizona, so it was a convenient stop on the way out of town. The result? An impossibly perfect expression of the classic margherita pizza. Also, everything else on their menu is fantastic. But seriously, the margherita pizza is ridiculous. Nora’s is another fantastic Italian place, and it is in Las Vegas. We enjoyed everything that we ordered, including a Caesar Salad, Calamari Fritti, a delicious Chicken Marsala, and even their regular pasta with marinara sauce was something to write home about. Nora comes highly recommended. There are also many great Middle Eastern, Thai and Sushi restaurants in Las Vegas, but these were the ones that we ate at on our last visit. While you’re walking down the strip, pause for the majestic Bellagio fountains show. You might even glimpse a perfect rainbow in the fountains! While you are at the Bellagio, stroll through the beautiful indoor gardens. The theme of the garden changes throughout the year and each exhibit is gorgeous. It attracts many tourists because the fresh flours and extravagant displays are quite the spectacle to see. In addition, the Bellagio entrance boasts an incredible display of Chihuly artwork. My aunt has been involved in the arts movement in Las Vegas since she moved there so we have enjoyed several different interesting art walks and exhibits. Before you go, research to see what is happening in the community while you are there. We have seen an awesome display of graffiti art, shopped handmade jewelry and paintings of donuts, and even viewed the playful artwork of Peter Max. If you are planning to just stop in some art galleries in hotels along the strip, I highly recommend Peter Lik’s gallery in the Venetian. His photographs are breathtaking. I’ve never been to The Neon Museum but it is #1 on my list for the next time that I visit Las Vegas. The Neon Museum is like a graveyard for the old neon signs of Las Vegas. You have to make a reservation in advance, and I am really looking forward to experiencing it next time. Biffs Bagels is one of my favorite places to eat in Flagstaff. They have the best bagels in Flagstaff which has put them on the map. 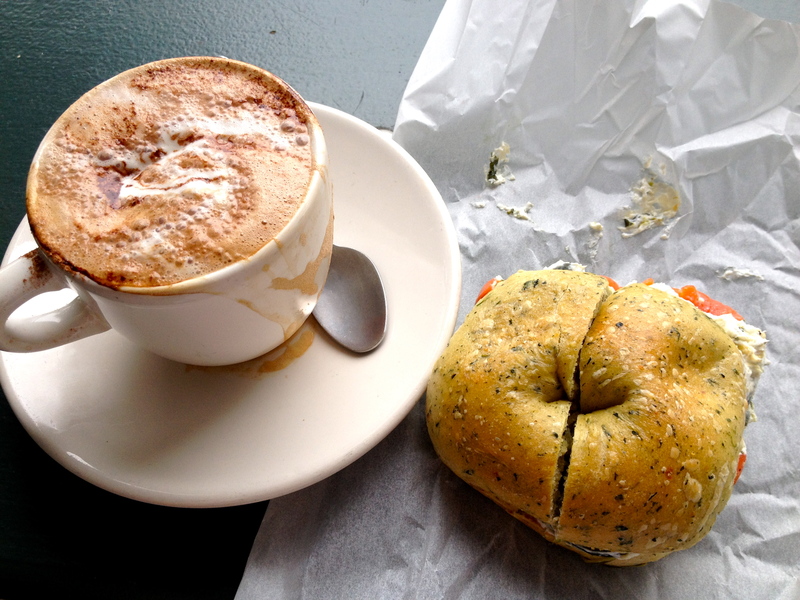 My favorite is their spinach bagel with artichoke spinach cream cheese and smoked salmon! Sometimes they’ll even put cucumbers on it for you. Biffs is in a central location between downtown and NAU campus, and they are right across the street from Macy’s (Macy’s coffee is featured in this image- I would frequently get Biffs to go and take it across the street to Macy’s to enjoy my coffee and bagel on their patio). Macy’s coffee remains to be the best coffee that I’ve ever had in a coffee shop. You can’t enjoy Flagstaff’s cool mountain breeze without a warm Macy’s Special in hand; steamed hot chocolate and freshly brewed espresso with cocoa powder and house made whipped cream to top it off. Sometimes their baristas will even decorate your coffee with cute designs, as seen above. Macy’s is perfect on any day in Flagstaff, as the weather is never too warm. Check out their back patio for a little peace and quiet with your morning (or afternoon, or evening) coffee. Little Thai Kitchen was my all-time favorite restaurant all through college. Start with a smooth and creamy iced Thai tea. One of their specialties, The Evil Prince of the Wild Jungle, kept me coming back again and again. Its rich broth is scented with lemongrass, coconut milk and spices. Your choice of meat plus baby mushrooms complete the dish, but I like to sub snow peas instead of the mushrooms. Top it with crushed peanuts – it is the best. Your order of an entree also comes with a tiny house salad with peanut dressing, which is the most flavorful and creamy peanut dressing I’ve ever had. They also have some great appetizers, like curry potato wontons and tiger rolls (wonton rolls with cream cheese and sweet and sour sauce). My second favorite dish is called Rambo and it is a vivacious, spicy dish full of vegetables and brilliant flavors. Complete your meal with fried bananas – you won’t be disappointed! UPDATE: Pizza Furiosa has unfortunately closed. I recommend Pizzicletta instead. Pizza Furiosa was new to the Flagstaff dining scene right after I graduated, and I hope it has earned its rightful place by now. Pizza Furiosa has some of the best pizza and they even grow some of their ingredients! They offer gluten free crust as well, and some of their toppings are very unique. Start your meal with a cool and refreshing strawberry lemonade. Pizza Furiosa’s strawberry lemonade is not out of a soda fountain or from a mix; you can actually see strawberry seeds in the lemonade! 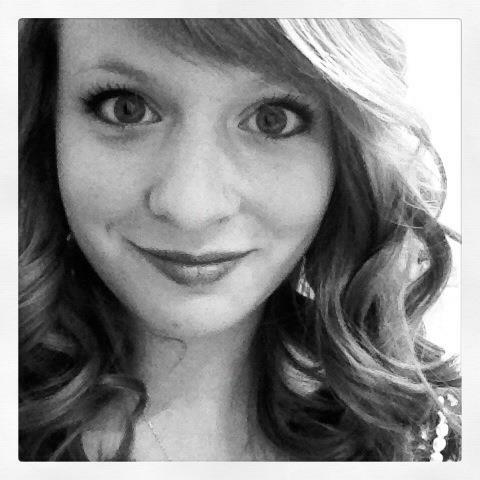 It is SO worth it. Trust me, I never order drinks at restaurants (except Thai tea), and I always order this when I dine at Pizza Furiosa. Next, sort your way through the tempting menu until you find the pizza just right for you. Do you love goat cheese? Pesto? Sausage? They have something just for you. Check out the special pizza of the day, sometimes these are the best (like the one above)! Not pictured- their meatball appetizer is delicious! Sushi in Flagstaff is slim picking, especially good sushi. Although Karma can be on the expensive side for a college student’s budget, their sushi is incredible so the price didn’t keep us away. Aside from the sushi, the fried rice is THE BEST fried rice EVER. I don’t know what they put in it (oyster sauce, maybe? magic? ), but it is awesome. Everything at Karma is delicious. I adore the Firecracker Roll and the Green Dragon Roll. Looking back at the menu, I’m dying to try the Autumn Roll and the Bonsai Roll! Next time! Do I really need to explain this one? I am a chocoholic, I admit it, and I am obsessed with Flagstaff Chocolate Company’s dark chocolate coconut clusters. They are divine. I have to say, I’ve had a lot of coconut clusters in my life, even at different chocolatiers in Flagstaff, but these are the best (I’m a big fan of coconut- have you tried my Toasted Coconut & Vanilla Popsicles?). Flagstaff Chocolate Company also sells a plethora of other fancy bonbons, brittles, and more, as can be expected. They also have fudge that melts in your mouth in a variety of flavors in addition to fresh gelato and ice creams. Simply, Flagstaff Chocolate Company is a must visit. It is conveniently located across from Heritage Square in Downtown Flagstaff among many quality restaurants and shopping destinations. UPDATE: New Frontiers was bought out by Whole Foods. I heard they still carry some of the previously loved pre-made foods, but I’m not sure if that’s the case. New Frontiers is a one-stop-shop for natural and organic groceries, snacks, fresh juice and even lunch! That’s right, much like Whole Foods, New Frontiers has a salad bar, soups, and a cold prepared foods section that actually puts Whole Foods to shame, in my opinion. Sometimes they have these half moon rice balls, which may sound weird but they’re fantastic. They also sell the best gazpacho I’ve ever had. The entire prepared foods bar at New Frontiers is amazing, I’ve never tried anything that I didn’t like. Everything is very unique. I love their juice bar, it is so affordable that it makes it hard to come back to Phoenix and pay $8 for a small sized juice. 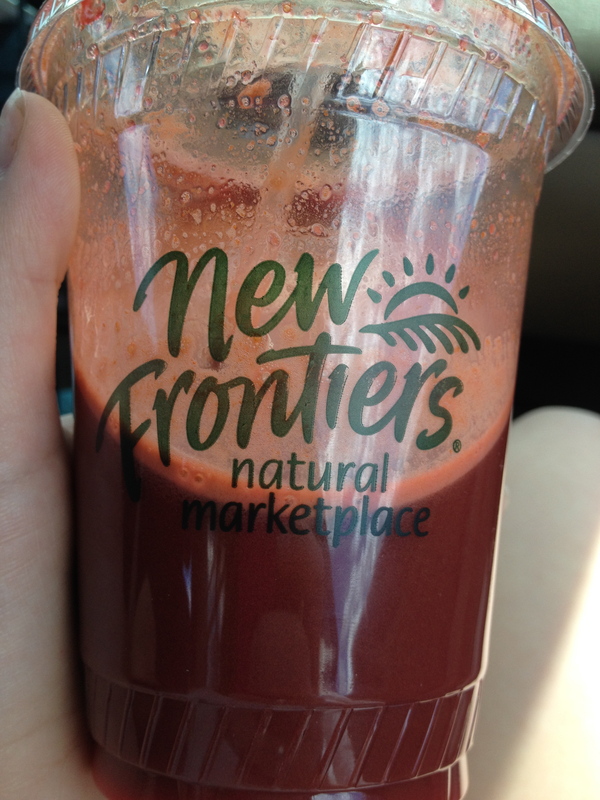 I highly recommend New Frontiers if you are looking for new snacks for the road, fresh juice, or a quick and healthy meal. Snowbowl is a popular destination during all seasons. During the summer you can enjoy a scenic sky ride to the top of the mountain for cool, fresh mountain breezes and a view that cannot be beat. Keep your eyes open for wildlife, you never know what you’ll see! During the winter Snowbowl opens its ski lifts for fun snow-filled adventures. Downtown Flagstaff is a great place to shop and dine. You can even catch a movie in the square on select Friday nights in the summer. The shops are the perfect place to purchase souvenirs, try on some crazy costumes, and learn about Flagstaff’s long history. Go ahead, buy some incense and natural soap- you know you want to, and it was likely locally made! Flagstaff is one of few dark sky cities in the states, and Lowell Observatory is the perfect place to enjoy the results- a clear view of more stars than you ever knew existed. On most nights they have select telescopes set up to view planets, the moon, or other celestial beauties. I love Lowell, but the second best place to view the stars is Mormon Lake. Great restaurants in Sedona are not easy to find, but Oaxaca is conveniently located on the lower end of the popular uptown shopping district. The views from Oaxaca’s patio are breathtaking. I love their espinaca con queso (as seen above) as well as their shrimp and green chili enchiladas when they have them on special. Oaxaca also has amazing drinks, like prickly pear lemonade. I recommend Oaxaca for lunch or dinner while visiting Sedona. We stopped at Dan’s Bistro for a quick lunch on a chilly day in Sedona. My friends loved their soups and sandwiches, and I adored my grilled chicken salad. Dan’s Bistro menu is straightforward with crowd pleasing items like grilled turkey breast sandwich with melted gruyere and cranberries, a portobello burger, and the option to build your own deli plate. Their dinner menu is much different with classic dishes such as fettucini alfredo and bouillabaisse. There is also a New Frontiers in Sedona, and as I mentioned before it is a convenient place to stop for lunch. Box up a fresh salad and take it to the creek to enjoy the great outdoors. Sedona is one of the most beautiful places to hike, and many hikes run along the scenic Oak Creek. Here you’ll find clear waters reflecting the impossibly beautiful red rocks that Sedona is famous for. This is the best way to enjoy Sedona’s magnificent beauty. Uptown Sedona is home to some funky shops that will entertain you for hours. Glowing candles, beads with special properties, amazing frozen bananas, cheap sunglasses, unique jewelry, and some of my favorite artists are just a few of the things you’ll come across. It’s really an adventure, you never know what you’ll find! Oak Creek Canyon keeps visitors coming to Sedona year round; in the spring, college students from NAU make the quick drive down to enjoy a lazy day by the water. Hikers enjoy the views during all seasons, and Autumn is the perfect time of year to set up camp right by the water. Camping in Sedona is one of the most classic ways to enjoy the area’s splendor. Tlaquepaque is a beautiful shopping and art district surrounded by fountains, flowers, and a few picturesque resorts. Stop by here to explore some local art, sample some wine from the region, or grab lunch at one of the restaurants in the area. I hope you find time to make it up to Northern Arizona soon. If you’re feeling up for an adventure, check out Fossil Creek as a day trip on your way up! St. Francis has become one of my favorite places in Phoenix, especially for happy hour. They have happy hour every day! That means Saturday and Sunday too! Plus St. Francis’ patio is gorgeous even during the summer. Start out your dining experience with a cool and refreshing Santa Rosa. During happy hour all of St. Francis’ cocktails are $5, and they are all pure works of art. The Santa Rosa is no exception; pink grapefruit juice and fresh basil are expertly combined with elder flower and vodka to create a drink that is perfect during the warm summer months. You can’t come to St. Francis without getting their Fingerling Potatoes. Don’t make the mistake of ordering the “side” of Fingerling Potatoes – the appetizer order comes with crispy fried herbs and parmesan cheese on top, which elevates the dish from good to out of this world! I don’t think I can explain my obsession with these potatoes; I tried to make them at home but nothing can compare. My 2nd favorite dish at St. Francis is their Pork Chili Verde. St. Francis has a wood burning oven in which they make many of their specialties, this one included. The pork is fall-apart-tender with a mixture of onions, tomatoes, etc that I imagine have been cooked down so long that the vegetables are hardly identifiable anymore, they only compose one thing: the stew that anchors the entire dish. Topped with a charred chili, fresh cilantro and jack cheese, and accompanied by a small side of corn bread, this is one that you don’t want to pass up. Goat cheese is amazing to begin with, but when it is baked into a gooey mess composed of fresh goat cheese, tomatoes and herb pesto and served alongside a fresh baguette… no one can resit. It is one of my favorite appetizers; it is so incredibly simple and satisfying. St. Francis features numerous seasonal soups during the year. In the fall, St. Francis sometimes has a pumpkin soup decorated with creme fresh and pomegranate jewels. Keep your eyes open for it this fall – this smooth and creamy soup is comforting and cozy during the chilly fall and winter days! This steak blew me away. It was perfectly cooked, melt in your mouth tender, and the sauce was a suiting accompaniment for the velvety potatoes underneath. This may be one of the best steaks I have ever had. This White Fish embodies summer; it is light, flavorful and the mixed bean and corn salad underneath is beautifully refreshing. The fish itself is flaky, tender and moist, topped with mixed herbs that brighten the already vibrant dish. St. Francis also serves some very popular flatbreads, salads, sandwiches and burgers.